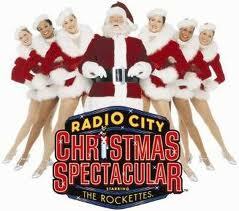 Besides which, the Rockettes got to star in a 'video game' presented in '3DLive'! That was hilarious. Given my fondness for city Christmas, it should be no surprise that I was transported by the Christmas in NY number. PLUS THERE WERE ICE SKATERS. THEY CAME UP THROUGH THE FLOOR! I was also surprised by how much I liked the Live Nativity. It might have been the way one camel kept eying the scrim like it was tasty, but the sheer spectacle of it kept me fascinated. I love ridiculous spectacle, after all. Throw in some impressive high-kicking, sparkly costumes, live animals, a double-decker bus and pyrotechnics and I'd say you've got a recipe for a damn good time.